The Line is quite simply where we place the car on the track at what point in the corner. 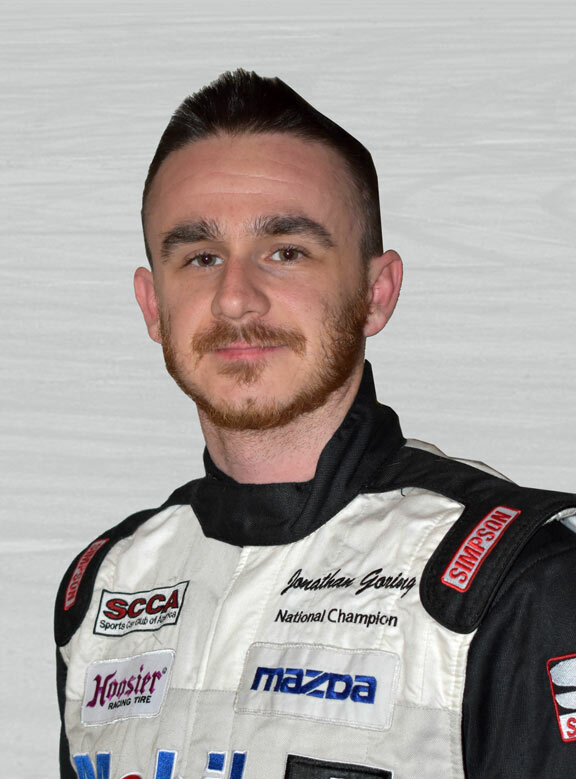 As a high performance driver/racer with lap time improvement in mind, our goal is to get around a twisty piece of asphalt in the quickest possible time. In doing so, we must realize there are only a few variables we have control over. 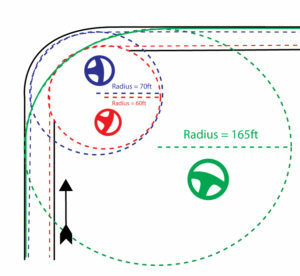 We can Increase the Radius (Arc) the Car is Traveling On, Maximize the Grip Potential of the Car and Travel Over the Shortest Distance Possible. One of these variables by itself can be be very fast in its own way, but surely won’t be the quickest way possible without the other two. 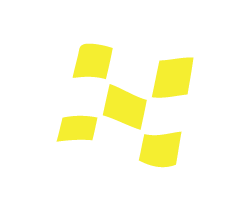 It is some combination of these three variables that will result in the best sector time for a given set of corners. Let’s Talk About Increasing Radius (R) (The Arc The Car Is Traveling On) First…. If we’re trying to go as fast as possible wouldn’t it make sense to try to make all the corners as straight as we can? We all know it makes perfect sense that a sharper corner is slower than a more gradual one, but we need to have a thorough understanding of why that really is the case. Why is it that we are always trying to expand radius of the corner? Why does it make sense from a performance driving standpoint? What is it allowing us to do that makes it so much better? Let me ask you this- can you go faster in a parking garage or on the highway? And why? I always ask my students this at some point during their first track day and I get a variety of answers but not usually the one I’m looking for. We all know the highway is faster but when I ask my students why that is they say things like “because the car won’t skid” or, “because it’s a tighter turn.” They’re on the right track, but they couldn’t define exactly why. Listen up folks, here is why. The more we turn the steering wheel, the more we must slow down. Ask yourself, can I go faster with my steering wheel straight or turning? How much are you turning in the parking garage? How much on the highway? The more you turn that steering wheel the slower you MUST go. It is crucial to understand that your steering wheel position has a direct reflection of your speed potential. The Car Always Wants to Go Straight. The more time you have your steering wheel closer to straight the faster physics will allow you to go. It isn’t until we grind the tires against the pavement in a direction other than the one the car is traveling on do we get the car to reluctantly turn. Sometimes we might not have the traction we ask for, and this gets the car closer to the point of sliding, works against what the car wants to do (which is go straight) and is a process that robs us of our speed potential. The less of this we turn and the straighter we keep that steering wheel the less we must slow down, the sooner we can pick up throttle. AND the less likely we are to crash! Let’s minimize this ugly process of turning as much as we can and expand the radius of the corner by using the “wide-tight-wide” philosophy shown below in Figure 1.1. Take a Look at the Red, Blue and Green Lines. Each line has their own unique strategy. Grip wise, let’s assume grip (G) is consistent on all of the lines. The red line takes the absolute shortest distance but comes at a high cost- lots of steering angle. The blue line takes an even longer distance and we can only steer marginally less. This blue line would only be marginally better. Remember that overall steering angle has the highest priority when thinking in terms of line selection. 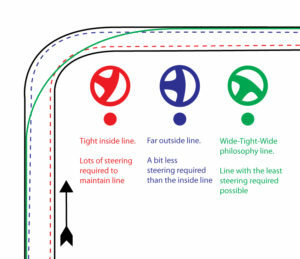 Being said, the green line has the least steering angle for the turn and is the gold standard technique for performance driving- the “wide-tight-wide” philosophy. And Here is Where I Give You the Gold. “Finding the line” is just fancy words for learning to turn the steering wheel less. When thinking about line technique it is imperative that we become obsessed with (and addicted to) turning less. I’m talking about foaming at the mouth kind of wanting to turn less. All turning does is slow the car down, willingly or not, brings us closer to the loss of control and uses up our equipment and therefore even our wallet. Anything you learn from here on out about performance driving will just be fancy ways of allowing us to keep that wheel straighter overall in the course of a lap. Whether it be car set up or driver improvement. We are Always Looking to Expand the Radius of the Corner as Much as We Can. Our car placement will define our line. However, in the quest of lap time we often tend to sacrifice a little radius in the corner itself to enhance the straightaway speed pre or post corner. This is where line technique gets fun, and what separates the best from the rest. 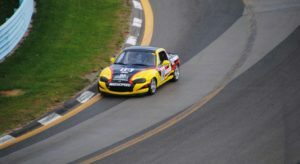 Knowing How to Adjust the Line to Favor a Section of the Track is Key for Setting a Good Lap Time. But remember, the ultimate goal is the least possible overall steering angle per lap, finding the ideal compromise of lines to result in the biggest net gain, and therefore the straightest the race track can be. 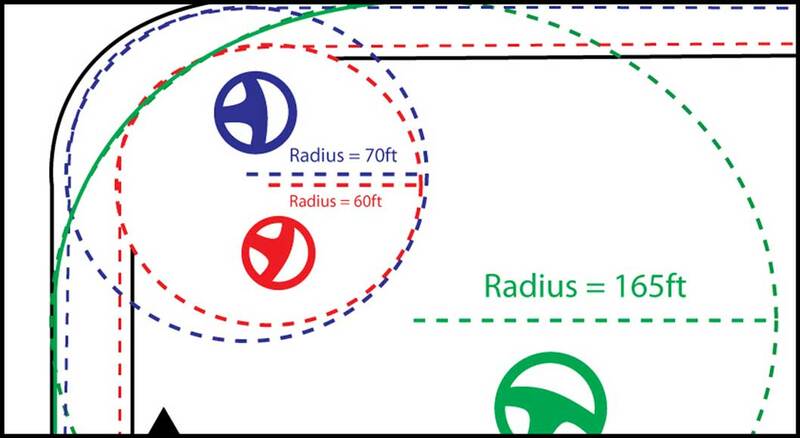 This article defines the basics of corner radius and gives us an idea of where we want our car placement to be in order to expand the radius the most and steer the least. Car placement on the track is huge- so much so that it makes it easier to be fast while also carrying the least risk. Simply, if we have good car placement we don’t have to work that hard to be reasonably fast. What’s better than that!